Fresh peach sorbet is a refreshing and easy-to-make dessert. Plus, there's no ice cream machine needed. Just a blender and a freezer and you are good to go. There's only four ingredients, so it's super simple and pure; the perfect summer dessert or afternoon treat. It's ideal to make this sorbet when peaches are in season. In the northeast, that is late summer. However, if you can't find fresh peaches, you can buy frozen sliced peaches. About 5 cups will be equivalent to the 8 peaches this recipe calls for. If you are buying fresh peaches, but it is out of season, check the peaches by giving them a good sniff. If they smell sweet and fruity they will produce better tasting sorbet. Make sure the peaches are soft and supple to the touch before peeling, slicing, and freezing them. 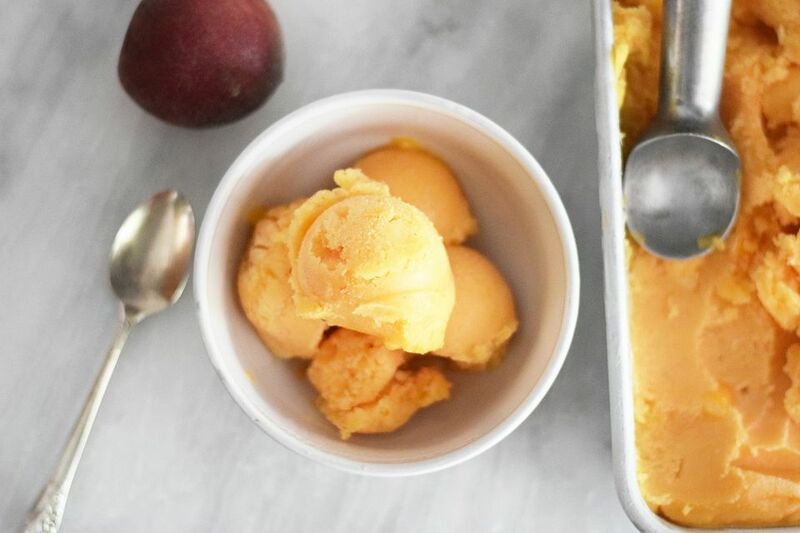 If you want this peach sorbet to come together faster, you can put the blended mixture into an ice cream maker and churn until completely frozen and the correct consistency, instead of putting it in the freezer. You can also top this delicious sorbet with fresh fruit. Raspberries work especially well! You can also use crumbled almond cookies or vanilla pirouettes for a bit of a crunch. Peel the ripe and sweet peaches and then slice them thinly. Place them in a plastic ziplock bag and freeze the peaches for 3 to 4 hours or until completely frozen. Try to place the peaches in an even, flat layer in the bag and place them flat on a freezer shelf so they can be broken up and put in the blender easily. Pour the lemonade (water can also be substituted) into a measuring cup. Add the 1 cup of sugar and 1 tablespoon of freshly squeezed lemon juice. Stir the mixture until the sugar dissolves somewhat. Pour the lemonade mixture into a blender and then add the frozen peach pieces. If the frozen peaches formed a kind of block, break it up into smaller pieces before adding it to the blender. Blend on high until smooth. You can eat it immediately as a a kind of soft serve sorbet or place it in a loaf pan, cover in plastic wrap, and freeze. Freeze the peach sorbet for at least 5 hours or until completely frozen. You can even freeze it overnight if you want to be sure it is completely frozen. Scoop and serve the sorbet when you are ready to eat! If you are over 21 and feeling fancy, add a small scoop to a glass of champagne for an ice cold bellini or to a light citrus beer for a summer shandy!